This is the V Page of our A to Z guide to plants -- how to care for them, landscaping with them, and cooking and healing with them. 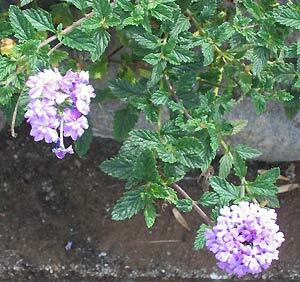 Benefits: Verbena enjoys a place in herbal history and is still used today in the Bach flower remedies. 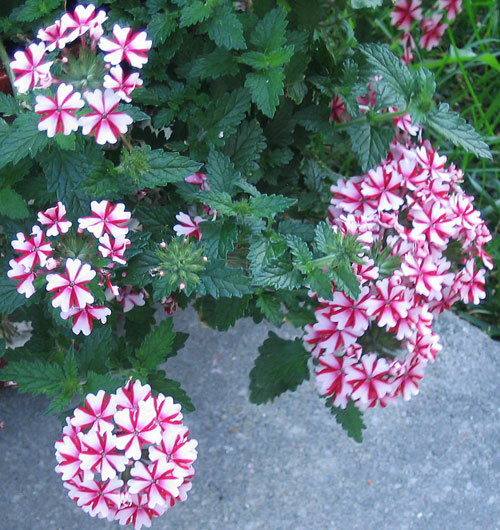 Planting and Care: Adaptable to a range of soil conditions, verbena is also more drought tolerant than plants with a similar appearance. It is also comfortable in full sun or in partial shade. This is a perennial groundcover that will easily spread. It will bloom endlessly if pruned regularly. Planting and Care: Plant it in full sun in more northerly gardens, but I think it would like some relief from the hot sun of more tropical gardens. Photographed: In the gardens at the Hotel Riviera on Lake Atitlan in Guatemala. Text and Photograph Copyrighted ©KO 2010. 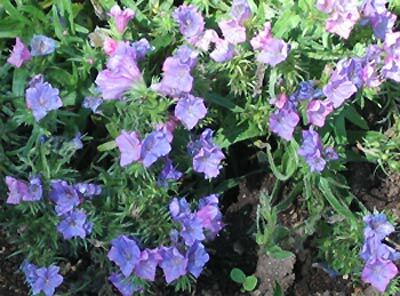 This low growing, one foot generally, bushy flowering plant is delightful filled with pink flowers that aging turn to most appealing shades of blue and fading they are with crimson. I never knew what they were, but now that I do, I'll order seeds. Benefits and Drawbacks: If you care about bees this is a survival plant for all of them. They simply love it. If you care about your hands, wear gloves when handling this plant. Photographed: In the Botanical Garden at the Hotel Atitlan on Lake Atitlan in Guatemala in 2012 and 2013. 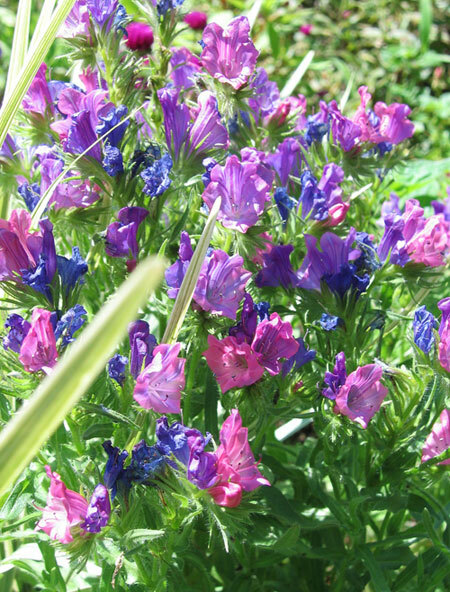 Planting and Care: Echium do not transplant well so you'll want to plant your seeds directly in the area where you'll want them to grow. I saw them first in a garden in the Guatemalan highlands growing in full sun and it's not where I would have put them, given the hot and strong sun. In a northern garden full sun is probably just fine; in a warm climate morning sun and freedom from afternoon sun would be preferable. I'm not always a fan of variegated leaves, but these greens on a background of cream frame these little blue flowers perfectly. 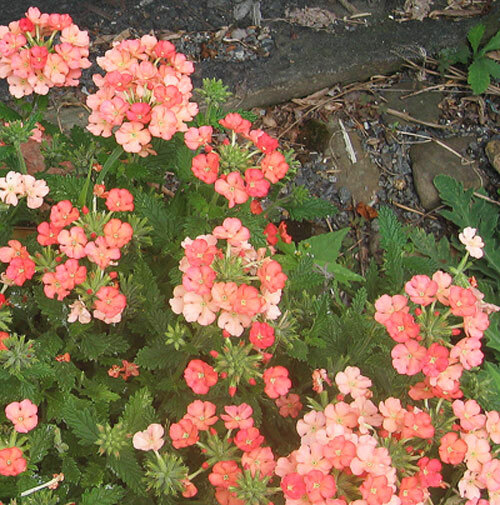 This is a perennial that will spread liberally as a ground cover. 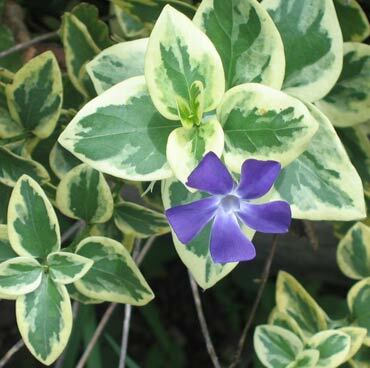 Planting and Care: This is a ground cover that will do well in the sun or in a semi shady area. Make sure it receives enough rainfall or watering to keep the soil moist. 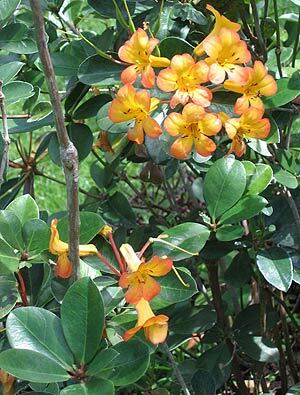 Benefits: This striking bush attracts butterflies and hummingbirds. 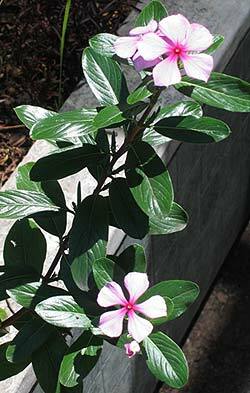 Planting and Care: Though this plant is said to prefer a semi shady location, we saw it thriving in full sun. Either way it likes routine rainfall or watering to look its best as well as a bit of a breeze if you can provide it. It will not survive a freezing winter. Volunteers are those wonderful visitors to the garden carried on the wind or brought by birds. 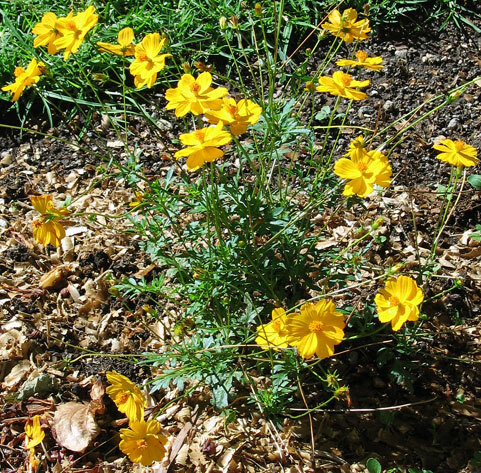 Right now I have a lovely coreopsis which I had nothing to do with planting. And, there have been many of these gifts from nature over the years. I think it is a good rule in the garden to leave what grows by accident unless you are sure it's a weed or something else you don't really want. Below you'll find photographs of some of my volunteers over the years. 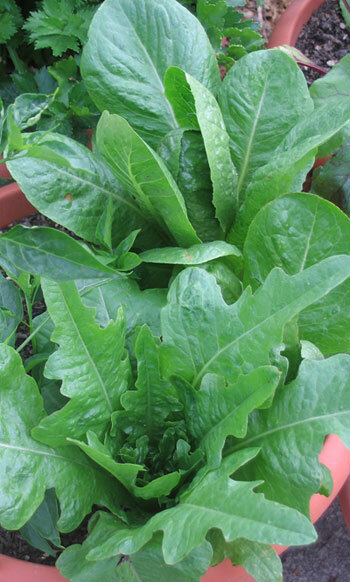 Oakleaf lettuce in the foreground growing in my pot of romaine lettuce. I thought it quite beautiful. A Coreopsis that Arrived in 2014. 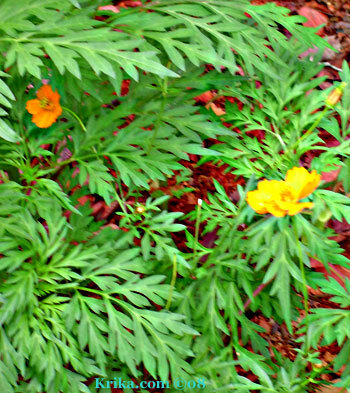 These lovely yellow and orange flowers came as volunteers and spread maybe more than I would have liked when I first let them blossom. They would make a great wildflower field.